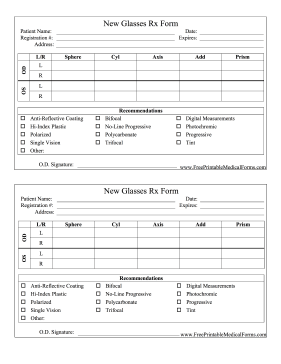 Optometrists can fill out this form when prescribing new glasses to their patients. DISCLAIMER: The medical forms, charts, and other printables contained on FreePrintableMedicalForms.com are not to be considered as medical or legal advice. All content is for informational purposes, and Savetz Publishing makes no claim as to accuracy, legality or suitability. The site owner shall not be held liable for any errors, omissions or for damages of any kind. This Medical Form is available in two versions: a free, ready-to-use version and a $3.99 editable version. The $3.99 version can be edited. It is compatible with Microsoft Word. The editable version can be customized. You can pay using your PayPal account or credit card. You'll be able to download the customizable medical form within moments. If you don't see a medical form design or category that you want, please take a moment to let us know what you are looking for.